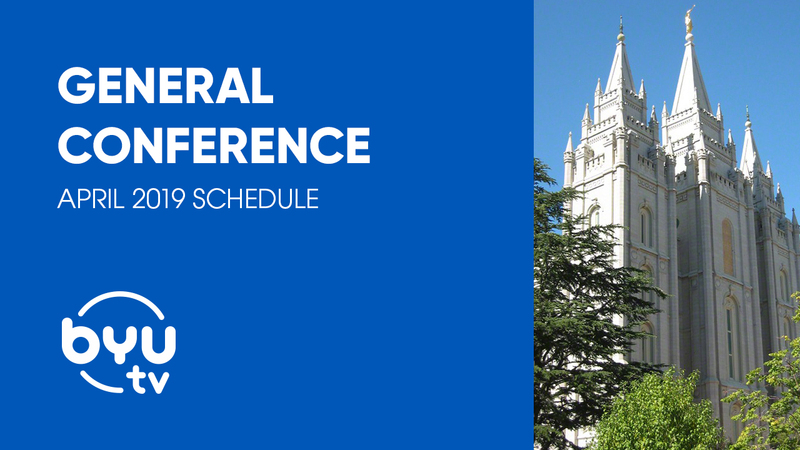 General Conference of The Church of Jesus Christ of Latter-day Saints and MORE! Twice a year, members of The Church of Jesus Christ of Latter-day Saints come together to enjoy the words and testimonies of Church leaders. 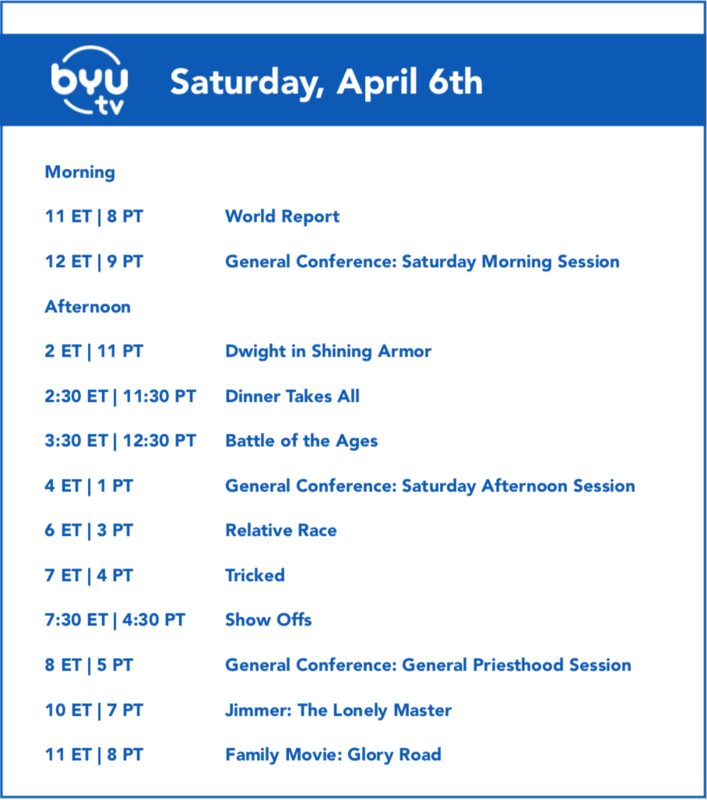 In addition to broadcasting the General Conference sessions, BYUtv is featuring programs everyone will love all day Saturday and Sunday. Be sure to tune in for a weekend filled with inspiring, heartwarming, and entertaining programming. 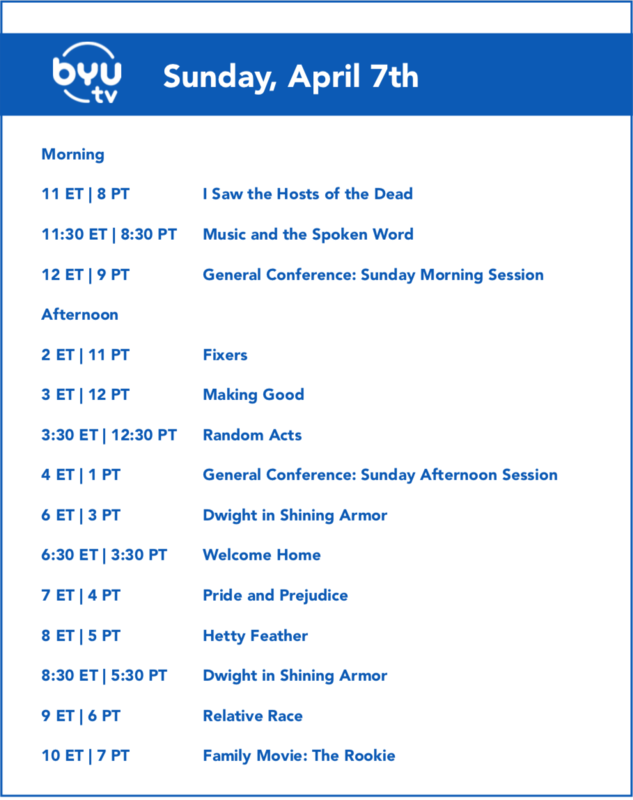 You can stream BYUtv at https://www.byutv.org/livetv or by using the free BYUtv app. 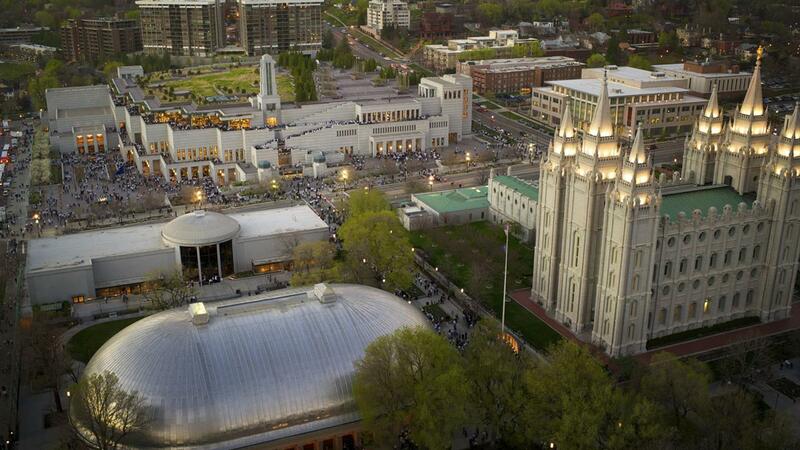 11 ET | 8 PT - The World Report of The Church of Jesus Christ of Latter-Day Saints: Stay up-to-date with LDS news stories from around the world. 2 ET | 11 PT - Dwight in Shining Armor: Dwight falls into an ancient chamber, wakes up a princess, and is now spellbound to protect her whether he likes it or not! 2:30 ET | 11:30 PT - Dinner Takes All: In an exciting series that combines a cooking competition with a game show, two families face off cooking their very best meals before the clock ticks down, while periodically getting interrupted to play delicious (and devious) games. 3:30 ET | 12:30 PT - Battle of the Ages: Battle of the Ages features two families, each made up of three generations, going head-to-head to test their knowledge of pop-culture trends and events throughout the ages. 6 ET | 3 PT - Relative Race: Witness the race of a lifetime as four teams complete thrilling challenges, discover new relatives, and compete for the grand prize of $50,000. 7 ET | 4 PT - Tricked: Using sleight-of-hand and a slew of disguises, world-famous magician Eric Leclerc goes undercover with hidden cameras to pull mind-bending pranks on unsuspecting people, transforming everyday situations into unforgettable memories. 7:30 ET | 4:30 PT - Show Offs: The Show Offs are a troupe of long-form improvisers like you've never seen. With no script and no rehearsals, watch as they make up a Shakespearean sonnet or hit the high notes in an improvised musical. 10 ET | 7 PT - Jimmer: The Lonely Master: The intimate film goes behind-the-scenes for his successful 2017-2018 Shanghai Sharks season and NBA journey. Includes exclusive interviews with Fredette and his family, coaches, teammates, ESPN analysts as well as footage of his personal life, childhood, and career. 11 ET | 7 PT - Family Movie: Glory Road: A coach's focus on talent leads to the first-ever all-black starting lineup to become NCAA champs. 11 ET | 8 PT - I Saw the Hosts of the Dead: Celebrate the 100th anniversary of President Joseph F. Smith's vision of the redemption of the dead. 11:30 ET | 8:30 PT - Music and the Spoken Word: Enjoy inspirational messages and music from the Mormon Tabernacle Choir in this live broadcast. 2 ET | 11 PT - Fixers: Four passionate builders travel the world to help communities in need. From drilling a freshwater well to providing a sustainable farmers market in a community, the Fixers do whatever it takes to save the world, one build at a time. 3 ET | 12 PT - Making Good: A well-meaning volunteer helps people by doing good across America, even if he has no idea how. 3:30 ET | 12:30 PT - Random Acts: Whimsical and heartwarming, BYUtv's original hidden-camera show highlights the good in humanity through surprise service projects and pranks with a purpose. 6 ET | 3 PT - Dwight in Shining Armor: Dwight falls into an ancient chamber, wakes up a princess, and is now spellbound to protect her whether he likes it or not! 6:30 ET | 3:30 PT - Welcome Home: Follow hosts, Treger and Rob Strasberg, as they run a non-profit dedicated to helping homeless families in transition. With the motto "design with dignity," these two turn houses into homes and change lives along the way. 7 ET | 4 PT - Pride and Prejudice: Meet the Bennet's 5 unmarried daughters; the beautiful Jane, the clever Elizabeth, the bookish Mary, the immature Kitty, and the wild Lydia. 8 ET | 5 PT - Hetty Feather: Hetty Feather may be an orphan unsure of where she came from, but one thing is for certain—her antics and adventures will keep you on your toes. 8:30 ET | 5:30 PT - Dwight in Shining Armor: Dwight falls into an ancient chamber, wakes up a princess, and is now spellbound to protect her whether he likes it or not! 9 ET | 6 PT - Relative Race: Witness the race of a lifetime as four teams complete thrilling challenges, discover new relatives, and compete for the grand prize of $50,000. 10 ET | 7 PT - Family Movie: The Rookie: Jim Morris's dreams of making it out of the minor leagues were crushed when a shoulder injury ended his pitching career twelve years ago. Now a high school chemistry teacher and baseball coach, Jim makes a deal with his team: if they win the district championship, Jim will try out with a major-league organization. We hope you have an amazing conference weekend spent with family and friends! And don't forget to share what you learn using #GeneralConference.